With every remodel there are many things to consider before you invest your hard-earned money and with a bathroom remodel is no different. You will spend hours considering color samples, tile choices and accessory options and many years living with the decisions that you made. This article was created to help you in your planning process. Listed below are five important things to consider when remodeling your bathroom, so it will be safe, practical and beautiful and provide you with many years of enjoyment. 1. Lighting: Functional and complimentary lighting is a must for any bathroom remodel. There is an actual art to casting light so it washes evenly across the hair and face without having any shadows. Sconces on each side of the mirror can help remove those gruesome shadows on your face that downlights alone can create. Generally, a “white” bulb color with a total wattage output of 75-150 watts works well; depending on the size of vanity. Do not forget lighting around the toilet. Lights situated at a guy’s backside might cast a shadow as he stands there which could increase the need to clean the bathroom more. Lighting around the shower and bathtub is a must to help avoid slip and falls. Put the lights on different switches or maybe even consider dimmable switches so you can set the mood in the bathroom or so it can be less harsh on your eyes to enter in the middle of the night. 2. Safety: This one ties in with #1. Good lighting is needed to have a safe bathroom, but safety goes well beyond lighting alone. Nearly two thirds of emergency room visits are caused from bathroom accidents. To help avoid accidents, slip resistant flooring is a must in any location that has any chance of moisture (bathrooms, showers, mudrooms, laundry…). Run your hand across the floor samples to see if you can feel any texture to help with traction. If the tile is smooth in such the case with marble; avoid using it on the floors unless you like to live dangerously. 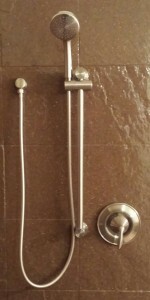 Fasten grab bars around toilets and in showers for those who need extra stability. Use low entry tubs and zero entry showers where needed. Make sure lighting and light switches are set to code so there is no chance of electrocution. Also, an ample amount of strategically placed outlets for your electric razors and hair dryers are a must. Make sure they are GFI outlets because of all the moisture and high risk of shock. 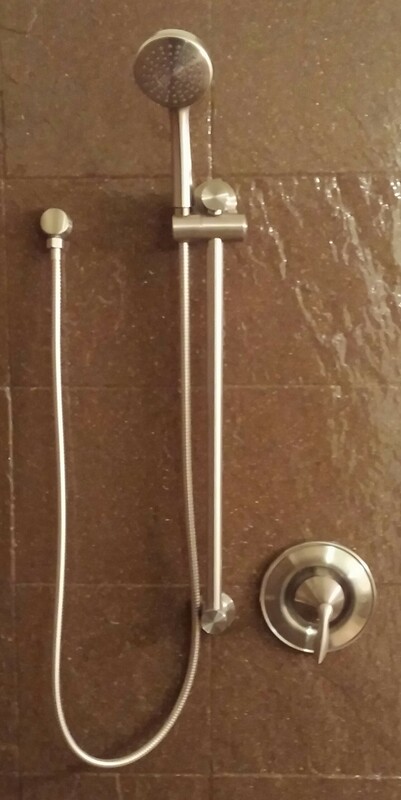 Onyx shower wall with a brushed nickel Moen Eva faucet with hand-held shower head, grab bar and pressure balancing posi-temp valve to help against sudden temperature changes such as when one flushes the toilet while you are in the shower. 3. Function: What are you goals with this bathroom remodel? Are you looking to sell in the near future? Are you looking to “Age in Place” in your current home? If you plan on selling soon; be sure to use neutral colors and install nice quality items but don’t splurge on non-essentials that you cannot recoup in the sale of your home. If you plan on living at your current address a while, consider what needs that you have in that bathroom. 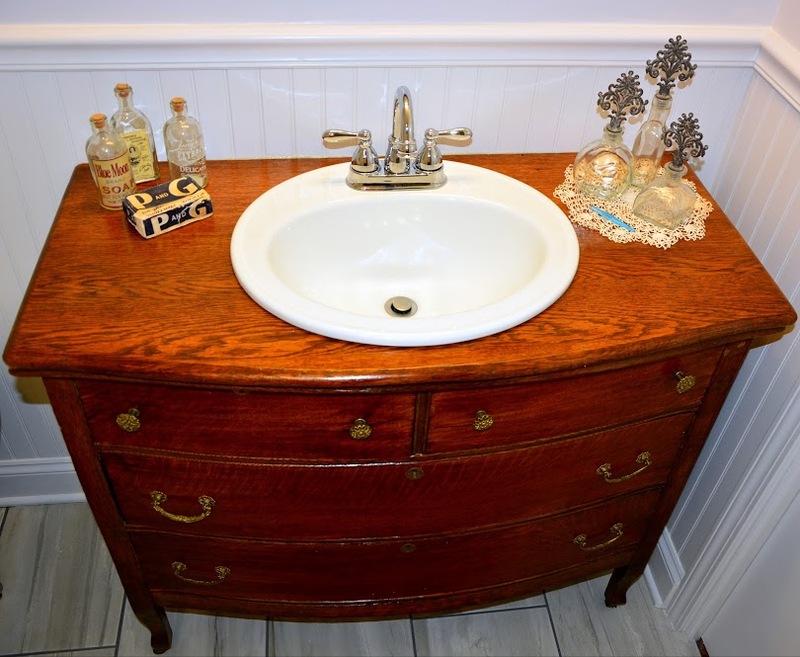 Do you need storage space or a larger vanity work top? 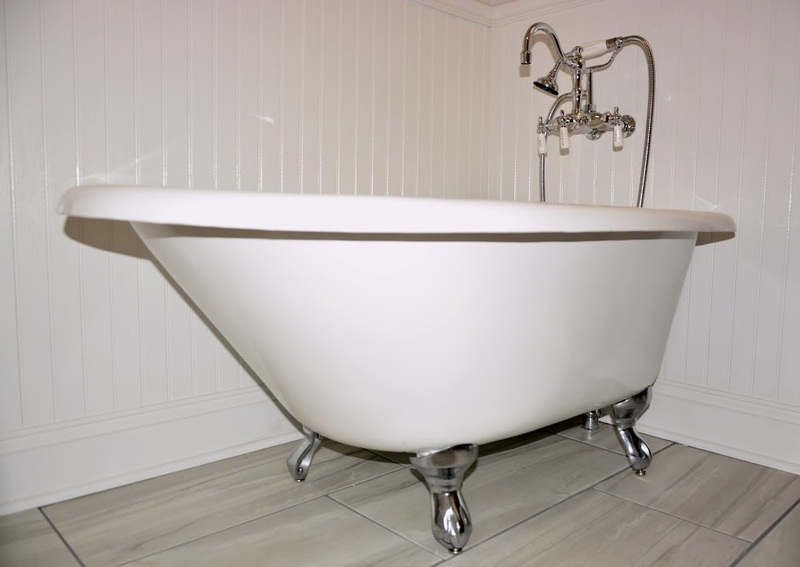 Do you need a hydrotherapy massage bathtub or do you even use a tub? Many homeowners are removing the big builder style jacuzzi tub and replacing it with a large walk in shower with multiple shower heads. Also, many are installing larger vanities with dual sinks and turning the current small shower into a storage closet. 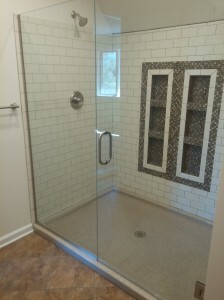 If you are looking to ‘Age in Place’ in your current home consider designing your bathroom with all the ADA features that you might unfortunately need down the road. Things such as grab bars, taller toilets, widened doorways and zero entry showers with built in seats and hand-held shower heads. 4. Exhaust fan: Improve the air quality in your bathroom by installing a ceiling exhaust fan. An exhaust fan can remove the smelly air and help freshen it up; leaving you less embarrassed with the surprise that you just left in there. Running an exhaust fan helps circulate air in the room which helps remove the moisture. This helps so mold doesn’t begin to grow and it even helps so the mirror doesn’t fog up. Make sure the fan has a duct that is ran to the outside and not just to your attic so the moisture is out of the home. Install the fan on its own switch so you can control when you want it on. There are many ceiling exhaust fans to choose from. In a small bathroom just outside your entertaining area; you might want to choose a noisy fan to help drain out unwanted noises. Many may want a quiet fan because that continual humming noise can be annoying. There are many options for bathroom exhaust fans including night lights, heaters and fan light combos. 5. Faucets: Homeowners show up at a big box store to see many options of faucets to choose from. There are good named brands out there priced competitively. A similar style and name brand could be priced drastically different from a big box store compared to a plumbing supply shop. If you are truly looking for the best deal make sure that you are comparing apples to apples; if it is the same model # or SKU #; it is the same product and of course, choose the cheaper place. If you look at price alone, you are not necessarily getting a better deal buying a cheaper one at a big box store because the quality is sometimes lesser than similar models around town. Though it is a dependable name brand; the cheaper options might contain plastic drain assemblies instead of metal, handle cartridges that are of lesser quality and the fixture bases are made of plastic with the finish over it instead of a sturdy metal fixture base for the finish to adhere too. As long as it is a major brand; the cheaper options will work, but the longevity won’t be there and the finishes are usually not as pretty after a little bit of use. 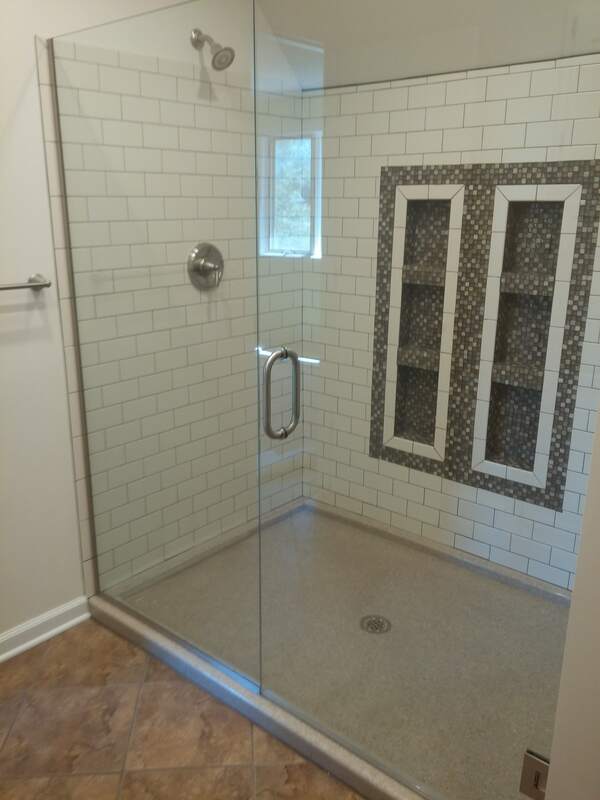 Just decide what your goals are for this bathroom remodel. Look at what features each faucet has because some faucets have the supply lines and the necessary connectors while others do not. This alone can make a huge difference in price. 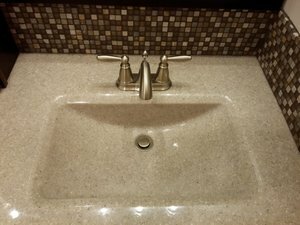 In conclusion, choose your goals for this bathroom remodel, but always select a major brand faucet and if you are truly looking for the best deal make sure that you are comparing apples to apples. Hopefully, you will consider these five important tips when remodeling your bathroom, so your remodel will be safe, practical and beautiful and provide you with many years of enjoyment. Now that you have these ideas of what to think about; you can now begin moving forward to do your remodel. If you are considering having this difficult work done do not choose a handyman. Only hire locally licensed and insured contractors for your bathroom remodel. Dream Home Enterprises has been serving the Kansas City area since 2003. We are a licensed General Contractor and Master Plumber with a passion for building, remodeling, renovating, repairing, and maintaining residential properties. DHE is known as a construction expert that uses in-house trained employees and proven service providers who want to excel as a craftsman, so you get a professional result. We can work with your design team and construct your remodel accordingly or we can design a unique space for you; then professionally build it. We provide a full-service DRAMA FREE REMODELING PACKAGE from Design to Completion. This frees you up so you can sit back and enjoy time with your family.